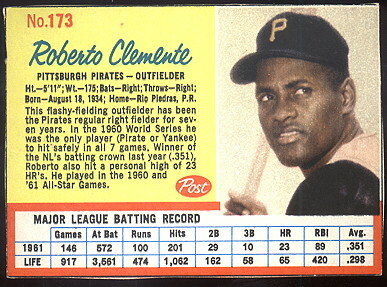 1962 Post Clemente, Blue Line Variation! RARE!! TOPPS & FLEER BASEBALL INSERTS, RODEO, POST, JELLO, SALADA, WHEATIES, KELLOGGS, HOSTESS, KAHN'S, ARMOUR COINS, MOTHER'S, BELL BRAND and MUCH MUCH MORE!! In this section we feature inserts, food brands and other odd ball items of some of your favorite oldtime players. These cards or coins are in a variety of conditions. Check out the links below and take a look!